Bearded sedge is a perennial rhizomatous species found in North America in many US states and several Canadian provinces (BC, Ontario, Quebec) (USDA 2011). In British Columbia, it is found in the southwestern and south-central regions in shorelines and wet meadows in the lowland, steppe and montane zones. In writing about the rare plants of the Fraser Valley, Lomer (2011) says: "Local in the Okanagan, rare elsewhere. Old collections from the Fraser Valley from 1912 (UBC: Henry s.n.) up to 1978. Surprisingly, it was discovered at three new sites in the Fraser Valley in 2008, after going un-noticed for a period of several years. It is well adapted to disturbed marshy shores and should be secure in the protected areas it has been found in: Cheam Wetlands Regional Park (UBC: T. Taylor 116), Burnaby Lake (UBC: Lomer 7065), Sumas Mt waterfowl habitat on private property. Also found in 2010 in a railroad ditch west of Agassiz and a wetland east of Agassiz. I suspect that, though native in the Fraser Valley, it has also been introduced as part of waterfowl enhancement plantings." Extracted from Botanical Electronic News #432, January 2011, with permission. A detailed species description is provide by Ball and Reznicek in Flora North America. 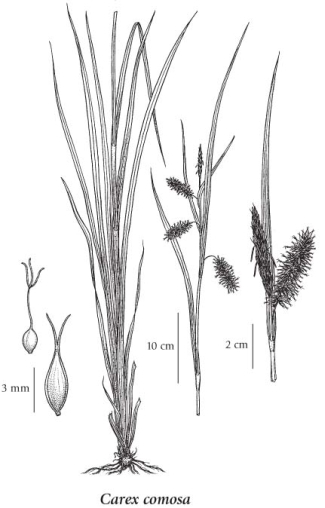 A detailed discussion on the genus Carex is also provided by Ball and Reznicek..
Perennial, densely tufted herb from short, stout rhizomes; stems 50-100 cm tall, shorter than the leaves. Sheaths light brown, the lower ones bladeless; blades several on each stem, flat, 4-11 mm wide, cross-walled, especially on the sheaths. Spikes 4 to 7, the terminal one lanceolate, 2-6 cm long, with male flowers, the lower 3 to 6 spikes, cylindrical, with female flowers, long-stalked, spreading or nodding; bracts subtending the female spikes tubular-sheathed, leaflike, lower bracts much longer than the inflorescence, the upper ones reduced. Perigynia lanceolate to narrowly egg-shaped, 5-7.5 mm long, 1.1-1.6 mm wide, pale greenish, convex, smooth above, 15- to 20-nerved, numerous, crowded, spreading or directed downward, short-stalked, the beaks almost as long as the body, bidentate, the teeth 1.2-2.3 mm long, curved outward; female scales egg-shaped, translucent, much shorter than the perigynia, the midribs extending into long rough awns, the awns almost twice as long as the scales; stigmas 3; achenes 3-angled, 1.2-1.8 mm long. Shorelines and wet meadows in the lowland, steppe and montane zones; rare in SW and SC BC; E to PQ, NB and NS and S to AR, SC, GA, FL, ID and CA.